olive and ollie: I'm back! Wow, what a whirlwind trip! We got back last night from our trip to Cleveland for my taping of Quilting Arts TV. I was totally nervous, but my dear friend Amy went with me and really helped calm my nerves. Plus she took lots of pics for me, including the one of me on set above. That's me behind the table! 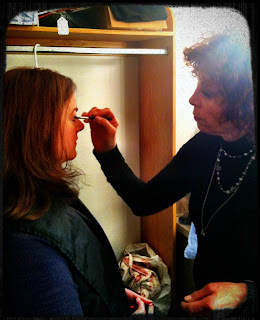 And this one of me in make-up. I honestly don't think I have ever worn so much make-up in my life. I'm a pretty simple girl, and Amy swore that I looked fine, but I felt like I had plaster on my face and raccoon eyes. The make-up artist was really great though, so I'm sure I was in good hands. And this is another reason why Amy rocks. 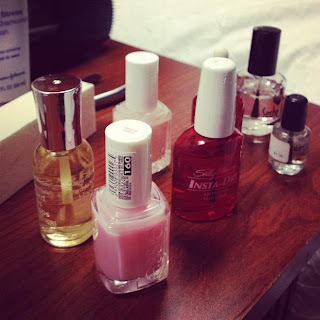 She brought a big stash of nail polish so we could have manicures in our hotel room on Sunday night. 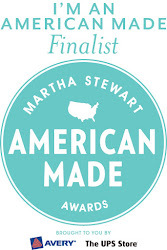 We laughed and laughed at some crazy shows on Food Network while we painted our nails. Ah, a girls' night out for two moms of young children--and it felt so weird to not have anyone to take care of! Amy took a lot more photos, although I haven't had a chance to even look at them yet. 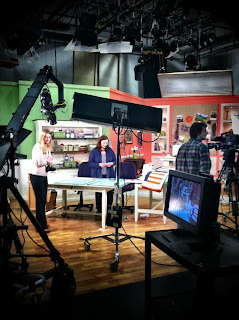 But I'm sure I'll have some more fun ones to share of my Quilting Arts TV adventure soon! Thanks for sharing your adventure! You and Amy sure know how to have fun :) Hope there will be more pics soon. How fun. I'll be looking forward to the show. Let us know when you know when it'll be aired. Can't wait to hear more!!! The best part had to be the manicures & GNO!! !